This is a red 1.5" grosgrain ribbon for the bottom base bow. Then 4 ribbons criss cross in the middle, two are a pink sparkly shimmering ribbon and the other two are a sheer sparkling ribbon with pink and purple circles on it. 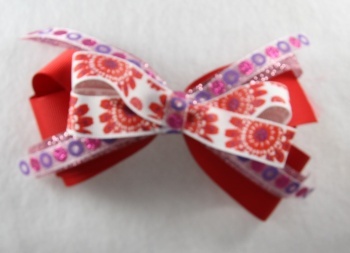 The top bow is a white grosgrain ribbon with red flowers, which has a sparkling purple center. This is a great mixture of red, purple, pink shimmering sparkles, very unique!